What Day Of The Week Is June 30? 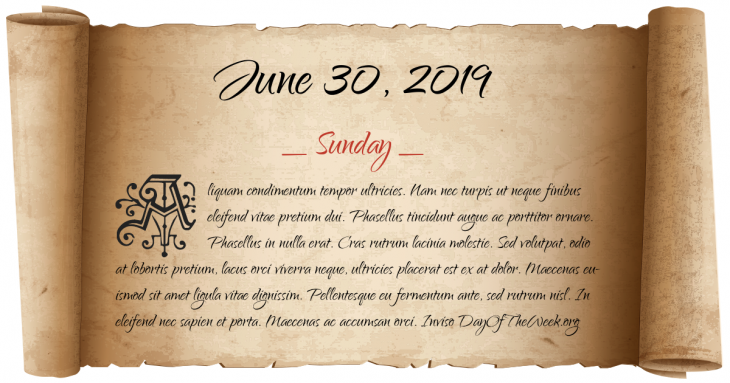 June 30, 2019 is the 181st day of the year 2019 in the Gregorian calendar. There are 184 days remaining until the end of the year. The day of the week is Sunday. The 1860 Oxford evolution debate at the Oxford University Museum of Natural History takes place. The Regina Cyclone hits Regina, Saskatchewan, killing 28. It remains Canada’s deadliest tornado event. U.S. President Warren G. Harding appoints former President William Howard Taft Chief Justice of the United States. In Washington D.C., U.S. Secretary of State Charles Evans Hughes and Dominican Ambassador Francisco J. Peynado sign the Hughes-Peynado agreement, which ends the United States occupation of the Dominican Republic. World War II: The Battle of Cherbourg ends with the fall of the strategically valuable port to American forces. A TWA Super Constellation and a United Airlines DC-7 (Flight 718) collide above the Grand Canyon in Arizona, United States, killing all 128 on board the two planes. Congo gains independence from Belgium. The Southeast Asia Treaty Organization disbands. 32 miners are killed when a coal mine catches fire in the Donbass region of Ukraine and releases toxic gas. Yemenia Flight 626 crashes into the Indian Ocean, near Comoros, killing all but one of the 153 passengers and crew on board. Who were born on June 30?